... has been to create a separate and specific To-Do list, entitled "Things Other People Are Waiting On Me To Do". It seems a really small thing but trust me on this, you have to try it! I really can't emphasise enough how useful this has been. I can't even fully explain why - I think it's something to do with how it really focuses the mind. I always feel more comfortable working on stuff that is more general, or is a new idea / experiment, or that is specifically for me, when I know that other people aren't waiting on me for stuff. Also, it allows you to prioritise effectively in those moments when you know you have only 20 minutes before a meeting: yes you could check your emails, or you could work on that presentation you have to give next week - but if you look down your Things Other People Are Waiting On Me To Do list and see a nice 20-minute sized task to complete, it feels like a really productive use of your time, which frees you up to concentrate fully on your own stuff later. I personally divide my list into People in Music and People in TFTV (the two departments I look after as an Academic Liaison Librarian), People in the Library (meaning the rest of the staff here in the Information Directorate) and Information Professional People (which is a catch-all term I use for stuff I do professionally like talks and presentations, the book etc). Obviously to some extent, everything we do at work is for other people - but having a separate to do list with, say, 'provide list of titles for X', 'order books for Y' and 'get back to Z about whatever' and those kind of specifics is a really effective way of helping organise my work-load. 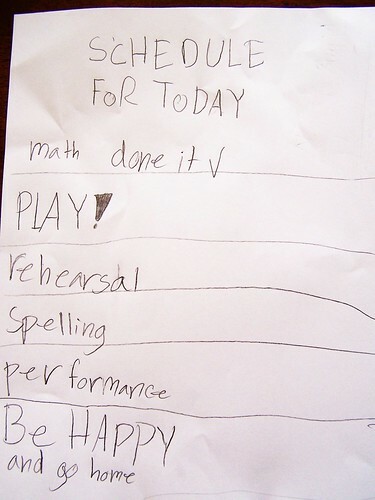 This doesn't replace my general to-do list, it runs alongside it. I add things to it as soon as they come in - it's a way of making sure I stay aware of the need to email someone back about something, rather than it staying in my mind for a bit and then slipping off my radar, for example. I have my list in Evernote, but it would work in whatever format you like your to-do lists in.